We have beautiful coral reefs without the crowds providing swimmers and snorkelers an ideal location for enjoying the tropical underwater world in a safe, comfortable environment. Just about anybody can participate in the sport of snorkeling regardless of age, skill and physical fitness. Snorkeling is one of the easiest, most fun and most popular ways to see the underwater world and very inexpensive. It’s often said that “theres nothing to it!” The truth is there are a number of skills to learn which make snorkeling easier and more enjoyable. Our snorkel briefings will teach the basics of mask clearing, kicking techniques and snorkel use through shallow water instruction. 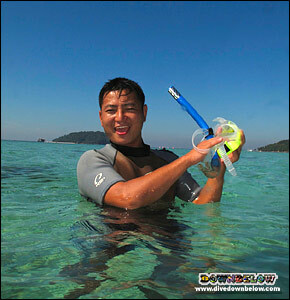 We offer various snorkeling programs catering for the non swimmer, beginner, intermediate and advanced snorkeler. So upon booking please let us know your experience level so that we can tailor your days snorkelling. After your orientation session hop aboard one of our fast, comfortable and spacious speedboats to embark on Downbelow’s Snorkel Safari. We offer you the flexibility to visit some of the best snorkel sites in the marine park. Our qualified snorkel guides will assess the conditions on the day and choose the best islands and location to suit the environment and your comfort level in the water. After your orientation session you will be spending the day jumping from the boat onto sites otherwise not accessible. If jumping into the water is rather daunting, don’t worry you can use our boat ladder for easy access or you can snorkel the shallow bays if you are nervous about deep water. Between each session of approximately 45 minutes you will return to our paradise PADI 5 Star Dive & Adventure Centre nestled in a secluded bay on Gaya Island where you will enjoy refreshments and a freshly cooked lunch. At all times you are in safe hands. We pride ourselves on small group instruction ensuring our clients get the very best of attention from the instructor. Safety is paramount, we adhere to PADI standards and procedures and HSE Guidelines. Our boats are equipped with marine radio, GPS & First Aid kits and our qualified snorkel guides always bring a life ring with them. Clients are also offered snorkel vests for comfort and floatation, so even non swimmers can join! All our guides are trained in Emergency First Response. Our all inclusive policy with no hidden charges means that you pay one price, which includes everything you will need for a great snorkeling safari. That’s return transfers from your hotel (KK City Centre only including Tanjung Aru – subject to confirmed bookings), boat transfers, guides, park and jetty fees and activity equipment. To quench your thirst and hunger pangs a free flow of water, tea and coffee is also included, as is a freshly cooked lunch. Book your Snorkel Safari today! Contact us to check availability or get more information.